The former chairman of the Executive Board of BNSF - Mr. R. Gyurov (forced to resign as of Jan. 29, 2013) has been previously identified and officially declared by the State Committee for disclosing the documents and announcing affiliation of Bulgarian citizens to the Communist State Security and Intelligence services of the Communist Bulgarian National Army as a "collaborateur" of the former pre-1989 Bulgarian counterpart of KGB!!! Mr. R. Gyurov claims to have acquired the scientific title of "professor" while functioning as a lecturer in a Marxist African University in Angola, however, he never passed any proper vetting procedure according to Bulgarian laws to obtain a legitimate professorship!!! Mr. R. Gyurov is currently employed by the so called New Bulgarian University - a private academic institution, which is a hereditary descendant of the former pre-1989 Communist Academy of Social Sciences and Economic Management. Recently (Nov. 2012) Mr. Gyurov, being a geologist by profession, was surprisingly awarded a "Doctor of Sciences" (Doctor Habil.) degree by another post-communist academic creation - the so called State University of Library Studies and Information Technologies, whose rector Prof. Stoyan Denchev has been similarly identified and declared by the State Committee for disclosing the documents and announcing affiliation of Bulgarian citizens to the Communist State Security and Intelligence services of the Communist Bulgarian National Army as a "collaborateur" of the former pre-1989 Bulgarian counterpart of KGB!! !, and whose institution (apparently as a token of gratitude for their services rendered to Mr. Gyurov) has been amply awarded 4 plentifully financed projects within the vigorously contested scandalous BNSF Call for projects 2012. One can get a pretty clear idea about the scientific "competence" of Mr. Gyurov and his disciples by considering the following excerpt from a report by Mr. Gyurov and his recently graduated Ph.D. student Dr. Ralitza Berberova at a National Conference with International Participation on "Space, Ecology, Nanotechnology and Savety" (2008). Below is the English translation with our comments and the Bulgarian original is here. 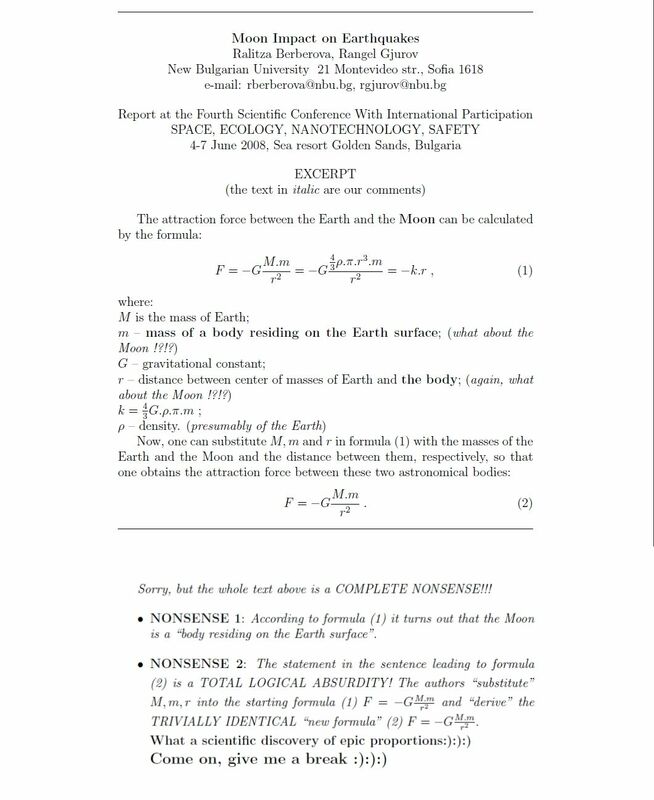 For a more thorough analysis of the new "ingenious" "Newton-Gyurov-Berberova" law of gravity :):):), see here. Obviously, even a high-school junior would be ashamed to put his name in such "scientific" NONSENSE!!! Let us also note that the coauthor Dr. Ralitza Berberova received a grant worth 100,000 Euro for a project, apparently passed with "excellent marks" in the "evaluation process" of the above mentioned scandalous rigged Call for project 2012. Of course, it would be infinitely more appropriate if Mr. Gyurov and Dr. Berberova would go back to high school and pass their school graduation exams in elementary physics and mathematics in the first place!! !